Whole Foods is having another great one day sale on Friday, August 19th, 2011. 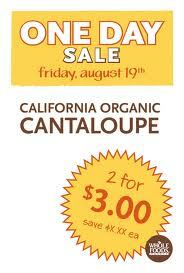 Stop in and pick up organic cantaloupe at 2/$3! This is cheaper than non-organic cantaloupe in my area. Did you know that Whole Foods offers printable coupons on their website? Learn more here.